Acme H4-102L4D2 socket H4 short 1U storage server (11.3"). This system is with special features--- 4 GbE (can add more), new Xeon E3 v5 computing power. It is good for industry controller, or small server. 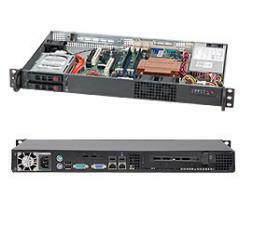 1U 11-inch rackmount system with Intel LGA1151 Xeon E3-1200 v6 series processors. Intel® Xeon® E3-1200 v6 series, Intel® 7st Gen Core i3, Intel® Pentium® and Celeron processors. Supports up to 64GB of Unbuffered ECC DDR4 2400MHz memory. 2-channel for best performance. 1 socket PCI-E 3.0 x2 - M.2 Form Factor: 2280 (accept M.2 NVMe drive). 1U RackMount case with 200W power supply (80+ gold), 2 of 2.5" HDD bays (hot-swap). dimension - Width: 17.2 in. Height: 1.7 in. Depth: 11.3 inch.